Posted on 3rd April 2019 at 11:18 am. Artificial grass is an extremely versatile form of surfacing that can be used for a wide range of applications and events. In recent years, more and more people have opted to buy artificial grass to use on their wedding day, as it can be utilised to create stunning decorations, striking backdrops and quirky surfacing, which all helps to create a truly memorable day for both the happy couple and their guests. 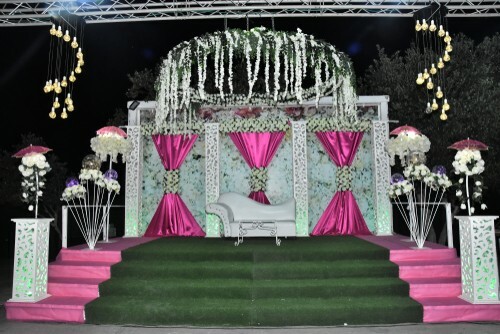 There are many reasons why artificial grass is perfect for your wedding. An obvious and major benefit is that, unlike the real thing, there’s no mud or mess, so you can forget about your guests getting mud on their best shoes or the bride and bridesmaids ruining the hems of their dresses. If little ones should fall over, not only will their outfits not be ruined, but the grass will cushion the impact of the fall. Fake turf can be used indoors, too, to create a unique wedding setting. Of course, once the big day is over, it can simply be rolled up and reused – maybe even in the back garden of the home of the newly married couple. You could see it as the first wedding present – and one of the most long-lasting. There are many advantages to artificial grass and today we are looking at some of the best uses for fake grass at a wedding and explaining how it can give your big day the edge. One of the most common uses for artificial grass at a wedding is to use strips of turf to create table decorations or table runners. There are many ways in which you can use fake grass to create beautiful decorations for the dinner tables at your wedding reception. Many people combine artificial grass with flowers or other forms of decoration to bring their tables to life. Today’s artificial grass looks just as good as the real thing, which makes it a great way of bringing the outdoors, indoors – and it will serve as a great icebreaker when your guests sit down for dinner. Don’t forget, the table runners can be reused again and again after your wedding day – at dinner parties, family occasions, Christmas or children’s birthday parties – and they make for a great keepsake to remember the occasion. A wedding backdrop creates a picture frame background for the happy couple and their guests to pose in front of so they can get the perfect picture to commemorate the occasion. Wedding backdrops are highly decorated free-standing walls or scenes that often complement the theme of the wedding. They can be created from a variety of materials but, in recent years, a growing trend has been to utilise artificial grass and/or plants to create a beautiful natural green backdrop. Wedding backdrops are easy to create, and many people opt to make their own. You can buy artificial grass in two metre or four metre widths and it can be cut to any length that you want, so it will perfectly fit your backdrop. Synthetic turf can be fixed to your vertical backdrop using either artificial grass adhesive or nails. The effort is sure to pay off, as wedding backdrops can be used several times throughout the wedding. They can be used as a backdrop during the wedding ceremony itself, for your guests to have their picture taken in front of, and as a display behind the top table at the reception. The obvious use for fake grass at a wedding is to utilise it as an aisle runner. 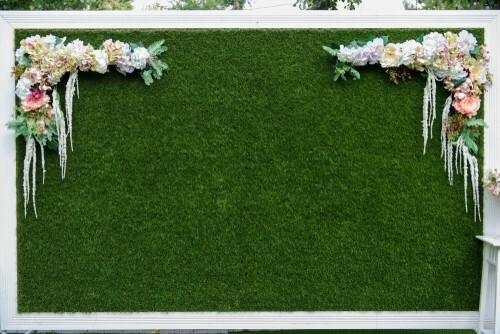 Using artificial turf is a great way to add something a bit different to your wedding ceremony and give it a quirky edge. Fake turf can be temporarily fixed to existing flooring to create a lush green walkway for the bride and her bridesmaids to walk down on the big day. It’ll show the dresses off beautifully. If there are any little bridesmaids or pageboys, they’ll especially love it. If they get fed up during the ceremony, they can sit down on the grass for a while! Everyone looks to make their wedding day a truly unforgettable experience for all concerned. It’s the small details that really matter and doing things a little bit differently will ensure that you and your guests have clear, lasting memories of the big day. If you are going to use artificial grass to surface the aisle, why not use it for the altar area, as well? Standing on lush green grass is far nicer than standing on cold concrete. It’s more comfortable to kneel down on, too! Fake turf is non-slip, so you can feel safe that you won’t trip over in front of all of your friends and family on the biggest day of your life. It will also make for some amazing photos. Once the wedding ceremony is over, of course, everyone heads off to the reception area, which offers another great opportunity to utilise artificial grass. It can be used as a temporary flooring in indoor rooms or marquees, and welcoming your guests with champagne and canapes on lush green grass would be a fantastic way to commence the wedding reception. Good quality fake grass is very hard-wearing, so you can be confident it will be strong and resilient enough to withstand lots of foot traffic. And, once the wedding is over, it can, of course, be rolled up and used elsewhere. With artificial grass being such a versatile material, there are many ways in which it can help create a truly memorable day for the bride and groom, and all of their guests, too. If you would like further information on using artificial grass at your wedding, then contact us today or call on 01245 931200. 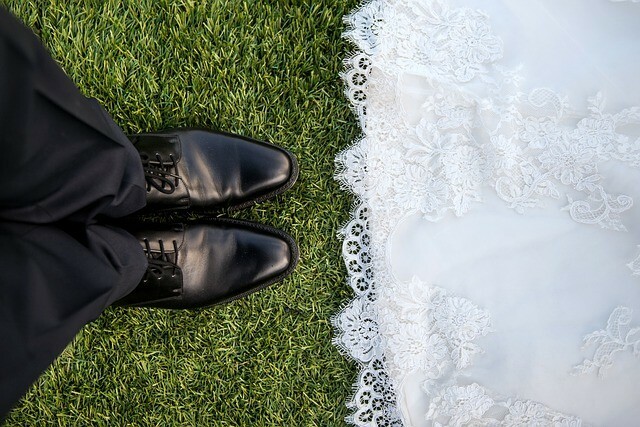 NeoGrass are suppliers for the UK’s most advanced fake turf and we have a range of products that would be ideal for the big day. Don’t forget, you can also get your free sample pack or, if you need to find an installer to temporarily fit your fake turf at your wedding venue, then you can find your nearest NeoGrass Approved Installer here.